We have taken vacations before - both times with my parents and we drove to New Hampshire and Pennsylvania. This vacation would be different. We were taking a plane - a first for The Boy. And we were going without my parents - a first for us. And we were going to Walt Disney World - a first for me and The Boy. Before The Boy, our vacation planning consisted of The Husband and I buying some airline tickets and packing our bags. Having a child on the autism spectrum sort of changed the way we do things. 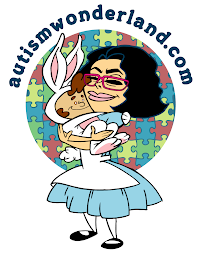 And a Walt Disney World vacation, especially with a child on the autism spectrum, requires a lot of preparation. Winging it is not an option. Ever. Our planning started in March. And it was a collective effort. First we sat down at the computer with The Boy and showed him websites to different hotels. We asked him where he would like to stay. We showed him various Disney hotels and then the Nickelodeon Hotel. He chose the Nickelodeon - which made sense, he was more familiar with the characters. 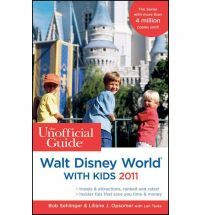 After the airline and hotel reservations were made and before I purchased the Disney park tickets, I picked up The Unofficial Guide to Walt Disney World with Kids 2011 and went through the entire book. Tabbing pages, highlighting paragraphs, making notes. This book is an amazing resource! I would highly recommend it to anyone taking the trip to Disney. The book noted height requirements, rated each ride by age group, duration of ride, when the best time to go and described each ride in detail (dark, scary, loud etc.) 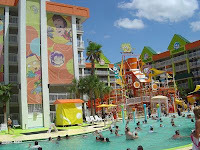 - for all four parks: The Magic Kingdom, Epcot, Disney Hollywood Studios and Animal Kingdom. Once we realized, that there were attractions in all four parks, we decided to purchase a 4 day park pass (next time around, we may do the 4 day park hopper - this allows guests to visit more than 1 park per day). Norrin is a patient in our practice. He has Autism Spectrum Disorder and sensory integration difficulties. Norrin may have difficulty waiting in long lines and the family would appreciate any accommodation that may be made during his stay at the parks. When we finally arrived at out first park - Epcot - at 9 am when it opened. We headed straight to guest services office to request a disability pass. The woman at the counter explained it was good at all four parks for the duration of our stay. She also didn't ask for a note, but still I carried it with me everytime we left the hotel - just in case. Anyway - so the disability pass could be used for attractions only. Not for character meets. (However, the pass does not guarantee immediate admission onto a ride. There may be a few minutes to wait.) We used the pass with discretion, making The Boy wait for some rides. It also gave him a chance to observe the ride and decide whether or not it was something he wanted to do. I gave him about 20 minutes, that was the cut off. Any wait longer than twenty minutes we showed the pass. And we only went on the rides that The Boy agreed to get on. If he said no, we respected his decision. Ultimately, it was a family vacation and everyone - including The Boy - played a part in the planning process.